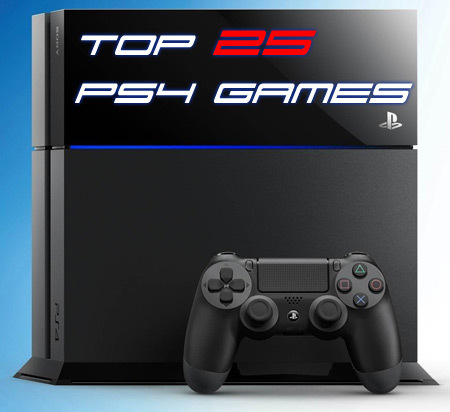 Top 25 PlayStation 4 Games Right Now Top 25 PlayStation 4 Games Right Now! » Top 25 PlayStation 4 Games Right Now! Top 25 PlayStation 4 Games Right Now! Consoles have it tough. Whenever a new system comes out, people are expecting a rush of massively awesome titles that overwhelm them, like a baby sea turtle caught in high tide, or a rat in a grocery store. Not sure where those examples came from, but we’ll run with it. The PS4 is glorious and it has glorious games. The list that is coming is huge, and the games are even bigger. Ladies and gentlemen, hypothetical rat and sea turtle, hold your hats because I’m about to rank the top 25 PS4 games. While it may have a simple art style and a story delivered entirely through text, Little Red Lie completely broke me and my expectations for video game storytelling. This amazing experience from Will O'Neill examines modern society from the perspective of a young woman drowning in debt, and a con artist who will do anything to make a quick buck. It's a story that will rip apart your emotions while simultaneously showing you a mirror image of the things many of us deal with every day. It's a very "real" story that will stick with me long into the future. Battlefield 1 is the hotly anticipated take on World War I for the series, and it turned out great. With a unique campaign structure that tells several unique stories, and a setting barely touched in gaming, it's a breath of fresh air. If you love Battlefield, you already own this. If you don't, then give it a try. I think you'll be very happy with your decision. The Last of Us is one of the most incredible, emotional, and heart-pounding games I’ve ever played. While originally released on the PS3, the PS4 version takes a gorgeous game and makes it look incredible. If you haven’t played this, you absolutely must. It has everything from an amazing story, to incredible gameplay, and even multiplayer for those who must have it. It’s the whole package, and this version also includes all of the DLC. A masterpiece in our time from the makers of the Uncharted series. Check this out while you wait for their next game. The months leading up to the release of the new DOOM were rocky to say the least. People didn't really dig the multiplayer beta, and others were worried the single player would come up short, but then it came out and we all had a lot of apologizing to do. While the multiplayer still isn't a COD killer, the singleplayer was an absolute blast from the past. Excellent graphics, smooth 60fps gameplay, amazing glory kills, and some of the most awesome monster designs in gaming made this a complete success. When Blizzard makes a game, people pay attention. This company, best known for World of Warcraft and Diablo, decided to try their hand at a competitive online shooter and Overwatch was the result. With a colorful style, a wide range of characters, and polished gameplay, people have really taken to this new title. As time goes on Blizzard plans to support the game with new content and more story to explain how all these guys, gals, and gorillas got together. If you like games like Team Fortress 2, Overwatch is right up your alley! While Call of Duty and Battlefield have often enjoyed the spotlight, Titanfall 2 proved that Respawn entertainment still has it. This sequel combines an excellent story campaign with the already beloved multiplayer combat. Whether it's the touching story, or the ability to call down your titan from the sky and jump inside, this shooter brings a lot of unique gameplay that you won't find anywhere else on the PS4. Cooperative gaming experiences, especially local co-op, are precious and rare. From Hazelight studios comes A Way Out. This is a new cooperative action game for the PS4 where you can play either locally or online. The game is only playable with a friend and requires you to work together in a huge variety of scenarios. The story revolves around two prisoners who must escape and find themselves with a mutual goal. It's a very engrossing story, a solid length, and you only need one copy to play online with your friends! We need more co-op games like this in the world. The Borderlands series has always been a quirky and hilarious world for people to enjoy, but the shooter games rarely capture that world as best they can. Luckily, Telltale Games stepped in to fix that. Doesn't matter if you know a single thing about Borderlands, you're going to love this game. An epic adventure with hilarious characters and amazing writing awaits! Fans of both ICO and Shadow of the Colossus waited for this release with bated breath. For a time, it looked like we would never get this title, but it eventually came. Yet another wholly unique title for the PS4, in this game you must work with Trico, a strange creature, to escape ancient ruins and ultimately discover the purpose behind it all. Trico can be frustrating when he doesn't listen to you, but the amazing A.I behind it all makes it impossible not to form a bond with this amazing creature as you journey through a beautiful and mysterious world. Firewatch is a hard game to rate because it has so many amazing elements, but ultimately it leaves you with a hollow feeling because of the way its story leads you in and pulls out the rug in the final act. That being said, in this game you play as a firewatch (what?!) working in the Wyoming wilderness. Your only point of contact is a woman named Delilah that you communicate with via a two-way radio. The game heavy, but the dialogue and acting are amazing. It's not an action game or a shooter, it's more of a human experience. Overall, it's a game I would recommend to anyone. Grand Theft Auto always shatters records when a new one is released. This one was no different, and when the massive open world game came out, people questioned when it would be on PS4. It was begging for a tuneup on the next generation console, and it eventually came. This incredible game manages to pack everything from heists, to car chases, to flying, golf, tennis, scuba diving, and plenty more into the same world. On top of this, you can switch between all three characters and must do so during certain missions. It’s one of the most technically advanced and most massive games ever made, but would you really expect any less from Rockstar Games? When Prey first launched, it had a few issues with the controls and frame pacing. After a few patches and PS4 Pro support, the game is in tip-top shape. Having finally sat down and played through it recently, I realized what all the fuss is about. Prey is a massively flexible and in-depth survival horror experience that mixes elements of Bioshock with a truly unique sci-fi storyline. There are so many ways to approach the game's missions and the variety of endings only sweetens the deal. The original Nier was one of the most interesting RPGs I've ever played, but I was convinced it would never get a sequel. Nier: Automata is proof that dreams do come true. A winning combination of Yoko Taro's vision and Platinum Game's exquisite gameplay make this one of the finest RPGs on the PS4. With tons of different endings and the need to play through the game multiple times just to see everything, this one will also keep you busy for a long time to come. Monster Hunter has been absent from the PlayStation for some time, but it has finally made its triumphant return in Monster Hunter: World. This version of the game overhauls many of the mechanics and presents everything with gorgeous graphics. If you're someone who fancies a good grind for loot, weapons, and armor, this game will keep you busy for a very long time. The addition of new monsters and content as time goes on only adds to this game's already long lifespan. Life is Strange came out of left field, but it's one heck of a heavy hitter. This time traveling adventure game is split into five incredible episodes that allow you to use your powers to travel back and try different decisions to see the outcome. It takes what Telltale started with choice driven games and adds in an element of time travel. It’s bursting at the seams with character and the tense nature of the game’s choices makes it all the more interesting. Imagine making a choice and then rewinding time when you decide you want to change the answer. It’s incredible, and really unique in terms of puzzle solving. Give this one a try, you’ll be glad you did. While many have said that Uncharted took inspiration from classic Tomb Raider, the latest entry on the PS4 proves that inspiration works both ways. This is an excellent title with a sprawling adventure and a huge amount of gameplay to experience. It doesn't quite topple Uncharted, but it comes close with stunning graphics and superb gameplay. The environmental puzzles are well-designed and the PS4 Pro support here is second-to-none. The original Destiny was a cool idea, but it had a lot of flaws. Destiny 2 came along and made a bunch of changes for the better. This hybrid between a shooter and a MMORPG works incredibly well in the newest version. A strong story, addictive gameplay, and plenty of activities to keep you busy long after the credits roll makes this an absolute must for those looking to find that perfect game to play online with friends. The Persona series has always been a big part of the JRPG world, but Persona 5 truly elevated the series to new heights. The incredible amount of style and substance here is stunning. An interesting story, plenty of side activities, and great combat makes this a must for those who consider themselves JRPG fans. I'm a big fan of games that have emotional stories, and What Remains of Edith Finch is easily one of the best. While you can finish the game in a couple hours, it will stick with you long after that. Explore the historical Finch house as you relive generations of a family that was convinced it had a curse placed upon it. With varied gameplay and absolutely stellar storytelling, this is easily one of my favorite games of all time. I show it to people whenever I can and they always walk away blown away. The Assassin's Creed series has certainly had its fair share of ups and downs. Origins was meant to change everything for the better, and it came through in spades. With an extra year of development, the game came out better than ever. The ancient Egypt setting is fresh and new, while the massive world and reworked mechanics make the game feel new again. It has single-handedly revived my love for the series. I highly recommend you try it, even if you're not a fan of the older ones. Wolfenstein II: The New Colossus has everything you could ever want from a first-person shooter. An exceptional story keeps you engaged from the beginning to the end, while sharp and responsive gunplay makes the action shine. It has a nice variety of locations, some truly powerful moments, and a few twists for good measure. It's a hallmark of modern gaming and one of my favorite titles ever made. Bring on the third entry! Naughty Dog has once again proven that they are the masters of their craft. Uncharted 4: A Thief's End succeeds in so many ways, it would take a separate list to explain all of them. Suffice to say, this is yet another incredible game from the folks who brought us Crash Bandicoot way back in the day. If you're a graphics person, a gameplay person, or just someone who absolutely loves mind-blowing games, you owe it to yourself to play this one. It can only be beat by something even larger and more grand than it. Here we go! Resident Evil VII went back to its roots and it paid off in spades. This return to survival horror is some of the best work Capcom has brought to the table since the series began. A great new setting and story is paired with positively atmospheric environments and great scares. It's easily the best horror experience you'll find on PS4. There’s so much to say about this game. Simply put, it’s one of the finest video games I’ve ever played, bar none. It has one of the largest and most realized worlds in gaming, one of the coolest main characters, and one of the best storylines there is to tell. You don’t need to have played the other two, it does help, but it’s not required. What you’ve got here is a game that pulls you in like none other. Into a world filled with magic, greed, racism, politics, war, all of the things that we know in our own world are realized here in deep and mature ways that make it and all of its problems feel real. There’s just nothing quite like it, and nothing that gives you more for your money. Guerilla Games is best known for the Killzone series, but with the release of Horizon: Zero Dawn, all of that changed. These developers created one of the compelling worlds in all of gaming while mastering the open world design. It's a game that must be played to be believed, but ten minutes with this gem will have you hooked. Pick it up with the added DLC "Frozen Wilds" for even more of what made this standout title so amazing. So there you have it, but the PS4 is still a toddler. Which games do you think will crack our list? What would you pick as your top game on the PS4 right now? Tell us in the comments! You're right, COD Ghosts has, well... it has a dog lol How about Battlefield 4? Now that looks awesome! Its been a while man :D Unfortunately there's no Warhawk confirmed for the PS4, but I did include it in one of my other articles called "top 4 games we want for the ps4" or something like that. Thanks guys, I appreciate this list. Had not really considered many of these games but now after looking into them I want to try them out.